1 Connecticut, Divorce Index, 1968-1997, Divorce record for James S and Leslie Hawke, Ancestry.com (Online Database). 2 Fort Worth Star-Telegram (Fort Worth, Texas), 13 OCT 2005, Obituary for father Howard Green, GenealogyBank.com. 3 Fort Worth Star-Telegram (Fort Worth, Texas), 23 FEB 2008, Obituary for mother Carol Rosalie Turner Johnson, GenealogyBank.com. 4 Texas Birth Index, 1903-1997, Birth record for son Ethan Green Hawke, Ancestry.com (Online Database). 5 Texas Birth Index, 1903-1997, Birth record for Leslie Carole Green, Ancestry.com (Online Database). 6 Texas, Marriage Index, 1824-2014, Marriage record for James S Hawke and Leslie C Green, Ancestry.com (Online Database). 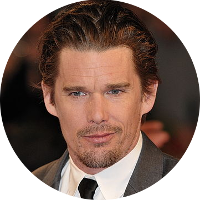 7 Wikipedia, "Ethan Hawke", (accessed 10/30/2017).